Keep optics clear and all microscope parts clean. 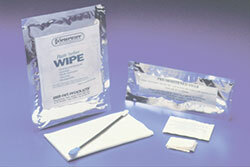 Kit contains 10 optic wipes, 2 premoistened swabs, 2 packs of plastic surface wipes with germicide, and complete instructions. Premoistened swabs eliminate the need for an aerosol dust remover containing ozone-depleting fluorocarbons harmful to the environment.